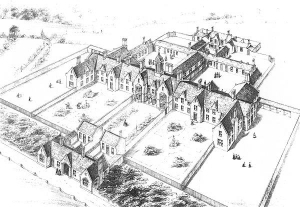 The English Workhouse could have been a home or a group of buildings rented or purchased by a local parish “for the poore of this cittye and also a house of correction for the vagrant and disorderly people within this cittye.” We often hear stories of harsh living conditions, inadequate nourishment, little or no pay for work performed, and generally a bleak and dismal life for those relegated to life within these communities. And, we often wonder what life was really like when living inside these dwellings. During the mid 1800’s living conditions in many workhouses became extremely difficult; and the prevailing thought was to build the workhouses (often called Poorhouses) larger and larger—with attendant illness and disease running rampant. By the early 1900’s some reforms were initiated, and by the end of WW2 state hospitals and mental “asylums” were established to remove those with infectious diseases and mental disability to separate hospitals—leading to the establishment of he National Health act of 1948. Beer was the beverage of the day, for young and old alike. The beer was, however, a weak brew—preferred over water that often brought on illnesses. The site deals with the workhouse of England, Scotland, Wales and Ireland; and includes much information on living conditions, food, rules, work, clothing, and many other facits of life for those falling outside the fringes of the general population. Of great interest to the genealogist are the lists of inmates and staff of many workhouses throughout the UK. Use the search input box, and type in CENSUS to begin your search. You can spend hours perusing this site, and much will be learned. WWW.workhouses.org.uk is a great site for those interested in the family history of the UK; and well worth your time to take a look. Download Hack works megaupload v1. For 2. Diamonds v1. 65 1 day Free of real now.